I have been making a few items to test the patterns and silhouettes I have chosen for my SWAP and this is one of the jackets. 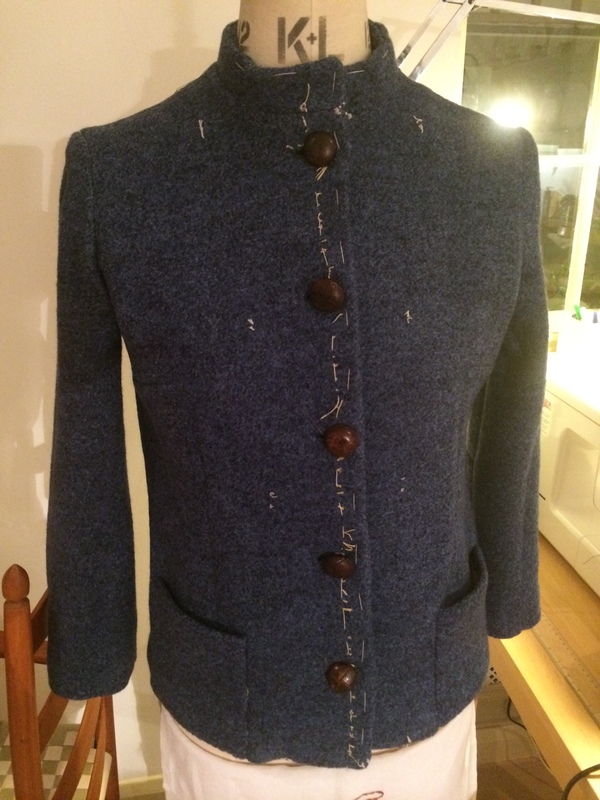 View 1, with buttons and button holes. This is a wearable toile – not my finest work but a well-made, wearable item in a fashion fabric, rather than calico. I find a historical size 12 about the right size for me, but I did lengthen the torso, just half an inch, above the bust in order to get the dart in the right place. This also made the jacket half an inch longer which is just fine. The sleeves were a bit long. I like them to finish, as in this picture, to reveal the wrist, so took out 1 inch from the length of the sleeve. I do not love patch pockets. This is because they are seen as the most simple to make, but if you don’t get them perfect, they give away that the item is home-made, and of course I don’t have them perfect. I have since found an excellent tutorial by Mary Funt which I shall adopt for the final version. Of course I could use a different pocket treatment, such as a welt with an oblong flap, but I feel the design is made for patch pockets, a tiny bit Chanel-like. I bought a piece of boiled wool at Simply Fabrics. It is a heavy jersey, pretty stretchy and a gorgeous blue, with flecks of navy and light blue. Both Esme and Bianca admired it and suggested it would work well with denim. Robert tells me it is a Nicole Fahri fabric and it is really nice. Very easy to sew (once stay stitched) and being both snug and warm while also feeling light. This makes me think it has polyester as well as wool in it. For the interfacing I used organdie and I have lined the jacket in painted silk. I used some of my vintage buttons for the jacket. 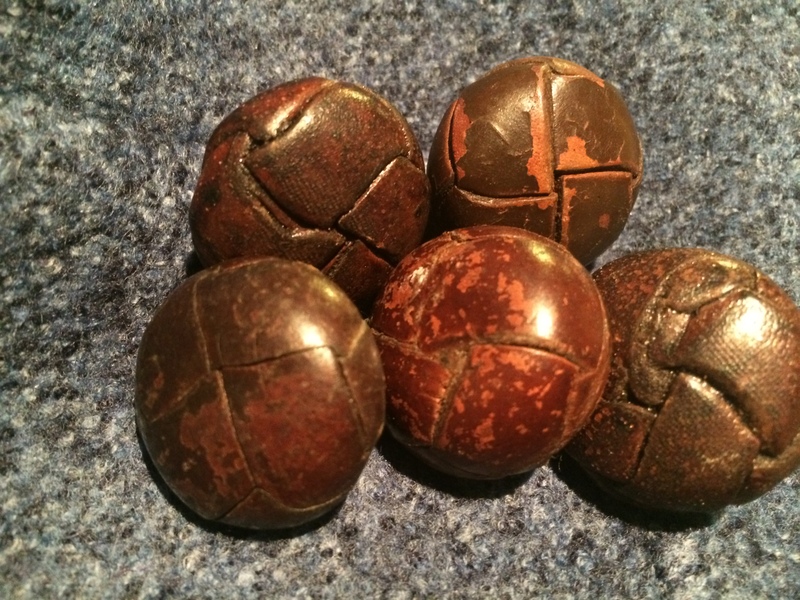 I didn’t have an exact matching set of five, but the ones I had have a great patina. 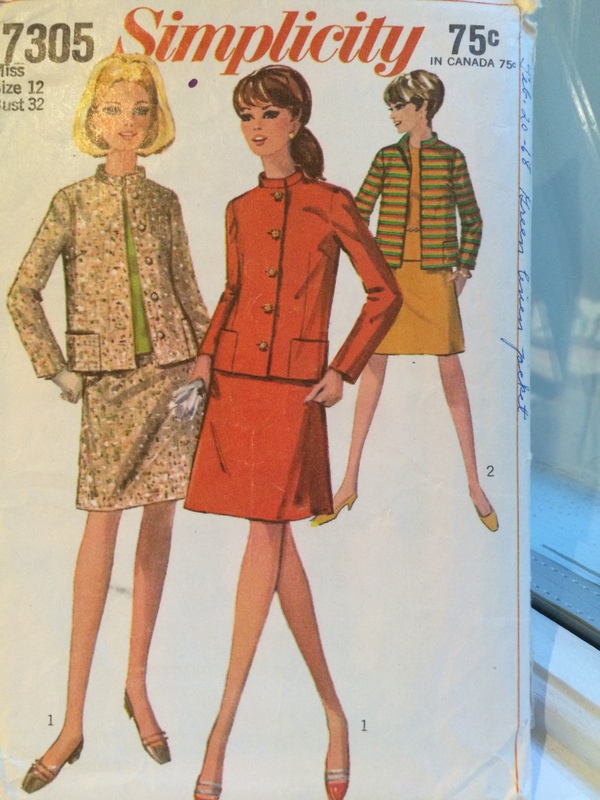 I guess they are at least as old as the pattern (1967) or possibly older. They have a leather loop on the back for stitching rather than a metal shank. So they could be from the 30s or 40s, almost certainly from a man’s country jacket. A nice simple construction. No ravel (it’s jersey), yet very stable. Bouncy but easy to press flat. Just great to ease in the sleeves. This is always my most favourite part of making a garment, especially a tailored one. This is how much fabric needed to be eased, and it went in perfectly. Fitting and inserting sleeves all day would be my dream job (in the background my hand printed PJs!). This also shows the colour of the fabric better than the button picture above. Once all the ease in the sleeve is pinned to the jacket at the right point it is basted in, tried on, corrected if necessary, then stitched by machine. The jacket is ready for lining, the final pressing. 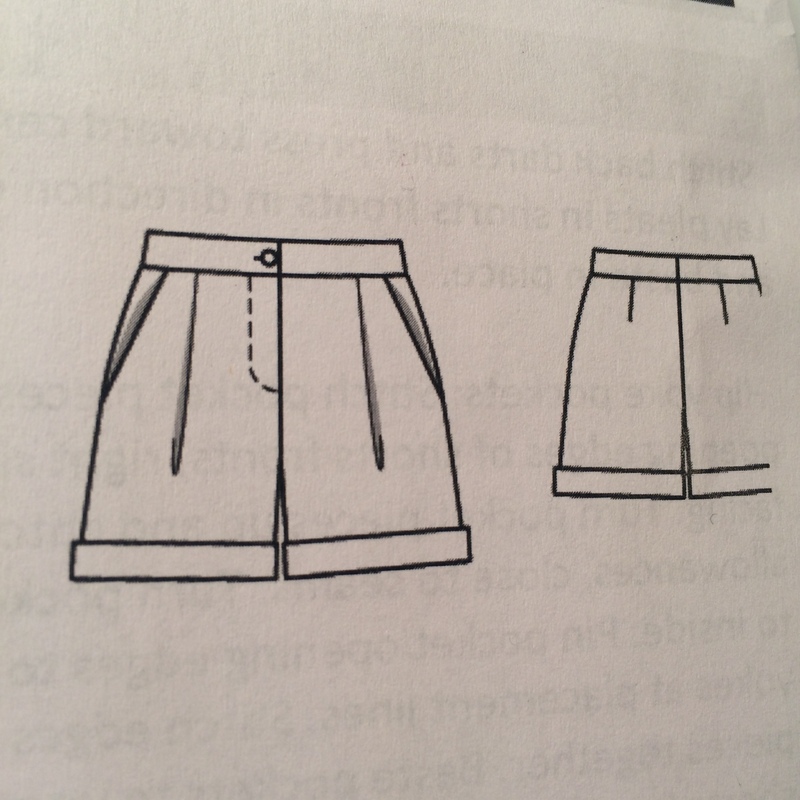 I don’t really care for the dull little A line skirt supplied with the pattern (although the blouse will be investigated at a later date). I think this suit may look good with shorts. Here is the pattern I have chosen. Heavy with the !!! this comment… but I can’t help it. So exciting! Keep up the great work. If only these buttons could talk ! I love this kind of details that makes garments so special. I imagine that if I were close to you, let’s say on the Tube, and had a look at your jacket, I would see these buttons and would be wondering for the rest of my journey how they possibly ended on a smart urban lady. Did she sew it herself ? Someone else did ? Or is it a fake patina on a RTW jacket ? I would then study your complete outfit to get some clues since I wouldn’t dare to ask ! I just LOVE your hand painted silk lining. I would be tempted to wear the whole thing inside out! Or at least to take it off with a theatrical flourish that reveals and draws attention to the lining. So inspiring! 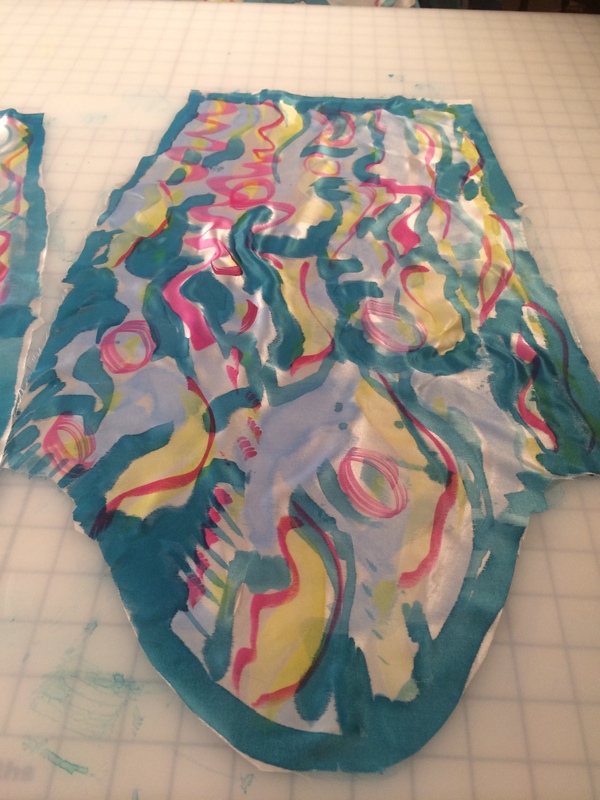 I like the idea of making a wearable toile as well as the painted silk. Thank you for sharing your process. Kate, Can you come here and sew my sleeve heads for me? 🙂 Just kidding. I have improved at them over the last six months! I have never made a jacket like this, so I am somewhat terrified (but also excited) to start my SWAP jacket project. That said, I am curious about the easing. It seems there are no basting stitches and you do this with pins. Do I have this correct? 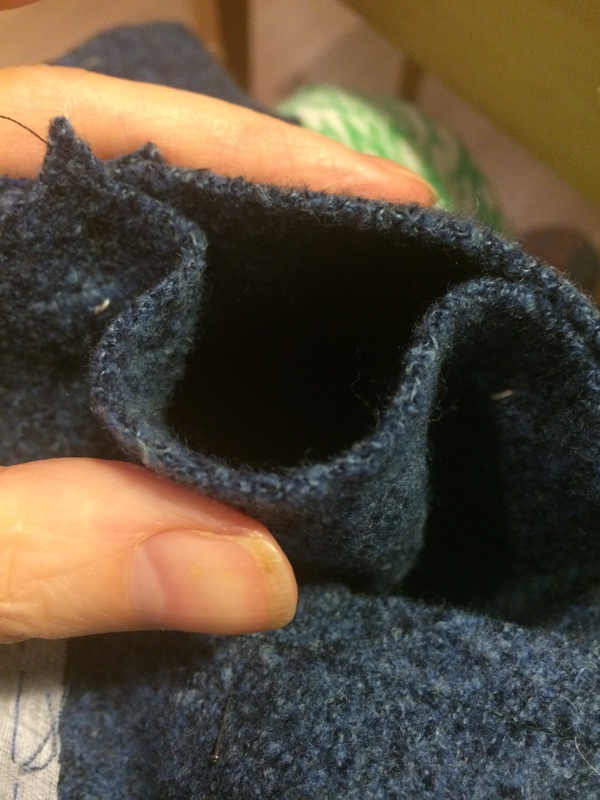 How much ease was in the jacket sleeve head (it seems like quite a bit in this case, which I didn’t expect). I also agree with Karine about the message sent by the cool vintage buttons. Before reading this I posted that I’m planning to use vintage buttons. I always try to do this on my knitting projects as it feels more personal to me. Oh and shorts …cool! Great fabric, too. Oops..sorry I see you the photo shows how much ease there was. My mistake. I’m SO impressed. The older I get the more time I spend imagining doing things rather than actually doing them. But can you tell us what buttonholes you used: i.e. are they simple machined buttonholes and did you use any sort of stabiliser? Hello Phnip! Thank you. Many vintage patterns let you decide for yourself, but I made bound button holes, and the front facings are backed with organdie. I usually do bound button holes on tailored items, but wouldn’t rule out machined ones if the fabric and style warranted it. What are you making at the moment (or what are you thinking about making)? I am having a productive time at the moment but there are times when I don’t do so much. Ha! What I’m not sewing at the moment is a chanel type jacket, like yours I think, with some gorgeous Linton Tweed I got in Carlisle a couple of months ago. Torquoise and pink with a wee bit of gold. I’ve got all the bits and pieces but perhaps the colours are a bit summery for now. So what I am actually sewing is badges on beavers uniforms and a tutenkamun outfit for the same wee boy and I had to put in a zip in a sofa cushion last week and I did take in a blouse which I made when I was a little larger. And I also made curtains for my daughter. I’ll get there but it’s all procrastination sewing right now. Your blog is great and I admire your methodical approach. Such wisdom! Well you have given me the answer. My sewing was on hold for around 25 years while my kids grew up and out of the house. Simples. I think you are doing amazingly well. Tutenkamun outfit?? Chanel jacket? Trip to Carlisle? 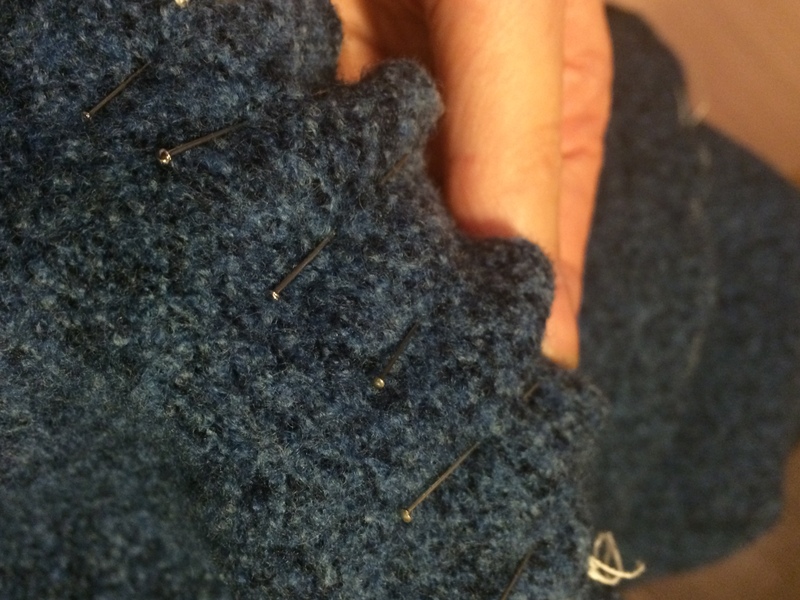 Zips in cushions (I just stitch them up…)? You are amazing and certainly set your bar very high.